These days we always find ourselves busy with classes, work and even hanging out with friends. It never seems that we have the time to eat. And when we have that time, we don’t eat right. Sure, the grab and go health bar or the ever-so-convenient fast food is always there for a quick pick me up, but with as much work as we do, we at least owe ourselves a tasty meal once in awhile. If this sounds like you and you want to know how to correct it, you’re in luck! With spring comes warm, happy dishes full of flavor and color and even the enticing visual of pulling out the grill. But depending on where you live, you may not have a grill or just don’t have the time to use one. No worries though, like the saying goes, “there’s always more than one way to skin a cat” or in this case, get some great, grilled food! Check out this easy one-hour stove grilled Italian and honey glazed chicken recipe. Preparation notes: For this recipe I typically use a chicken breast, but drumsticks, wings and chicken tenders works just as well. Depending on the type of chicken you use, you may need to thaw it the night before in the refrigerator or sink. I find that with chicken strips, I can simply run them under cold water for a few minutes before they’re ready for use. In a bowl that is big enough to lay your chicken breast in, combine the honey, honey mustard and Italian dressing. Whisk until blended well. Add in two tablespoons of pineapple juice from your canned pineapple and store the rest of the juice and pineapple in the fridge. Whisk marinade once more and set aside. 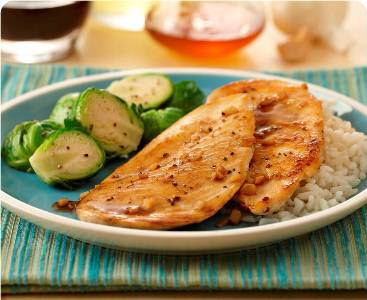 Wash thawed chicken breasts in cold water and remove extra fat if desired. Place a nonstick skillet (make sure it is big enough to fit all of the chicken you are preparing) on the stove and turn the burner to medium heat. With a pair of tongs, dip each chicken breast in marinade, making sure to cover all sides; place each piece into your hot skillet one at a time. Once all breasts are in the skillet, pour the rest of the marinade into the skillet, covering the chicken evenly. The chicken should cook between 20 to 45 minutes, depending on how high your stove is set to. Keeping an eye on the chicken, make sure to turn it over about every five minutes, and remember to move the chicken around so the marinade can coat the skin. Allow to continue cooking until done, and the marinade thickens up, caramelizing the meat. When chicken is completely done, remove it from the skillet and plate. To finish off my meal, I paired my Italian and honey glazed chicken with a side of white rice and the fresh pineapple I stored away earlier. The blend of hot and cold is a perfect match and further brings out the savory yet sweet flavors. This is definitely a go-to “treat yourself” meal for me. I hope it can be for you as well! Note: If you want to try this meal, but are very health conscious, try substituting brown rice for white rice, or even steamed vegetables and use fat free Italian dressing. If you’re not a fan of pineapple, substituting pineapple and pineapple juice with a fruit of your choosing, such as mangos, add a different but equally vibrant flavor. For an extra kick, try adding a dash of hot sauce or spicy brown mustard in lieu of honey mustard.